So here are the decals (This is the picture from BPS website as I was too eager again to use them and forgot to picture them before cutting them up!). 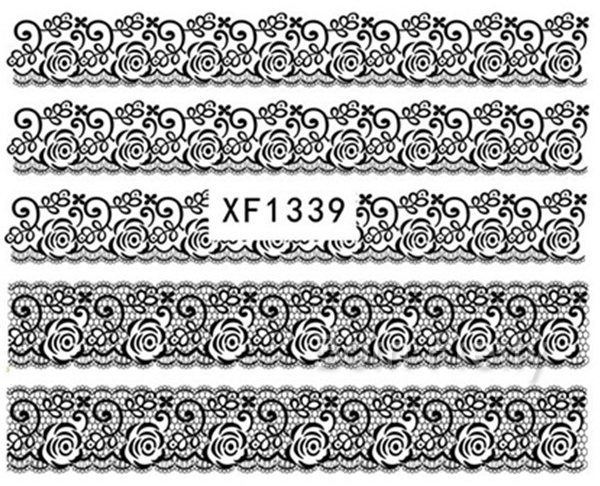 As you can see there are 5 decals in total with two different black lace designs. You can find them on the BPS website HERE and they cost £1.08 (approx $1.66). The only drawback I have is the code (XF1339) is printed across one of the decals (see picture above) so you don't have the full length. However, you do have two full decals of that design so it isn't a huge problem. Here you can see the two designs on my nail. One decal was enough for four of my nails and I used a small section of the other design for my thumb. As you can see they are of very high quality and are really gorgeous. I was very impressed especially for the price! As I said in my previous review the decals make nail art so quick and easy! These were especially perfect for me as I have been ill and so haven't been up to nail art. Therefore, these were the perfect solution. Here are another couple of pictures to show some different angles. They are really easy to apply; cut to size, remove the film, place in water for a minute, slide the decal off the backing paper and apply to nail. Simple! They sit smooth to your nail which is great as they won't get caught on anything and are flawless against your nail. It isn't at all obvious they are stuck on as the film is so thin! Overall, I am really pleased with these decals just as I was with the last set. I didn't expect anything less! 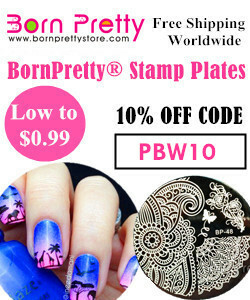 If you want to purchase these or any other products from Born Pretty Store you can use my discount code PBW10 for 10% off you order!